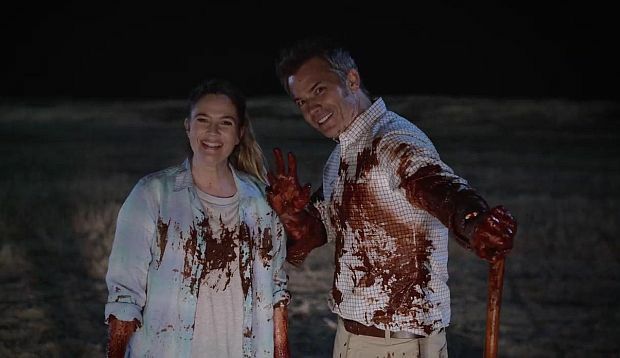 Drew Barrymore and Timothy Olyphant star in Netflix's Santa Clarita Diet. Early in February, Netflix premiered a new Netflix Original comedy called Santa Clarita Diet. There are many words I could have put in front of the word comedy just now – dark, family, fantasy, horror, zombie, etc. – but none of them on their own would adequately describe this dryly funny, regularly gory, often romantic, and entirely delightful new show. 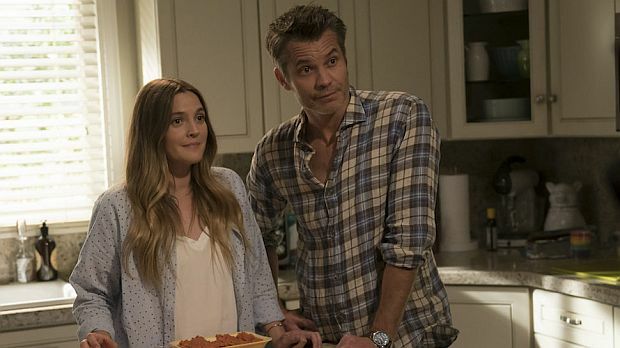 Created by Victor Fresco, Santa Clarita Diet stars Timothy Olyphant (Justified) and Drew Barrymore as Joel and Sheila Hammond, a realtor couple raising their 16-year-old daughter Abby (Australian actor/playwright Liv Hewson) in the very white, button-downed Los Angeles suburb of Santa Clarita, California. High school sweethearts in their 19th year of marriage, Joel and Sheila have clearly settled into a perfectly agreeable rut. ("I wish I was bold," Sheila muses to herself early in the first episode. "I'd like to be 20 percent bolder. No, more: 80 percent. No . . . that's too much. ") Over breakfast they bicker amiably about parenting strategies, kitchen appliances, and new cars, and spend their days hawking suburban homes to potential buyers – until one day, in the middle of an open house, Sheila unexpectedly dies for a few minutes before waking up with a taste for human flesh. There are many surprising and wonderful things about Santa Clarita, though I don't expect that the presence of zombies is among them. Prior to Santa Clarita's premiere, I believed (and hoped) we were on the other side of the too-popular zombie phenomenon, with two Walking Dead series on AMC and the more consistently entertaining iZombie beginning its third season on The CW on April 4th. But Santa Clarita has learned all the right lessons from the Walking Deads and iZombie, bringing not only brains (sorry about that!) but heart to the story it is telling. It certainly brings the gore – of the cannibalistic, flesh-eating variety – but frankly there's more genuine horror in an average episode of Breaking Bad than in the entirety of Santa Clarita's 10-episode first season. With more in common with a midlife-crisis family comedy than anything in the horror genre, the show has a fairly simple premise, a tight ensemble cast, and a confident sense of its own fun. Back in 2009, Victor Fresco gave us two short seasons of ABC's critically acclaimed, and then cancelled, corporate satire Better Off Ted. (Watch to the end of Santa Clarita's first season for an appearance by Better Off Ted's – and, yes, Arrested Development's – Portia de Rossi.) Fresco's involvement in a series generally guarantees quality, if not necessarily longevity (see NBC's Go On, for which Fresco worked as a consulting producer). In Better Off Ted, the office-comedy formula gave body to the sharp satirical bite of the series. For Santa Clarita Diet, the undead notwithstanding, it is suburban life that is its true subject. Skyler Gisondo and Liv Hewson in Santa Clarita Diet. Santa Clarita also proves that Timothy Olyphant continues to do his best work on television. In his groundbreaking dramatic roles on Deadwood and Justified, Olyphant would display a huge range of emotions with just his eyes. His most recent small-screen appearance was last year as a recurring guest on the unfortunately-cancelled Rob Lowe comedy, The Grinder, portraying a benignly narcissistic, and slightly dumb, version of himself. There he demonstrated that he was ready for broad comedy. As Joel, he plays broad, he plays dry, he plays big and small. And no one – it should be said – does geniality with barely suppressed rage as well as Timothy Olyphant. It also helps that he has a comfortable chemistry with Barrymore. Santa Clarita is notable for being Hollywood veteran Drew Barrymore's first regular television role. Pairing these two familiar faces could have been distracting, but the different energies each brings to their respective characters almost immediately results in one of the most compelling and sympathetic married couples currently on the air. Barrymore's madcap energy gives the recently-undead Sheila a joie de mort that grounds and lifts every scene she's in. Sheila's new appetite for human flesh also comes with a new lust for life (it turns that one of the side effects of becoming a zombie is a weakened superego). With few remaining anxieties – moral or social – Sheila is free not only to manifest some of her more primal drives (like a suddenly unrepressed libido) but also emotional ones. Sheila is often the most alive person in the room. Since Sheila – prior to her transformation – had long established herself as the practical and decisive partner of the two, Joel now struggles with being the adult in the relationship. (We learn later on that he's been largely swept along by his wife's momentum for most of their relationship – with few personal ambitions, self-medicating his soft malaise with pot.) But that indecisiveness and passivity are put to the test as Sheila's lack of impulse control challenges their status quo inside and outside the home. For example, the same day Sheila murders, and digests, her predatory co-worker – played by Nathan Fillion as the kind of man you immediately want to see eaten – she also buys herself a new Range Rover ("I've been wanting one ever since this morning"). It is unclear which of these actually upsets Joel more. Meet the Hammonds (Drew Barrymore and Timothy Olyphant). The wider cast not only includes some delightful guest stars (in addition to de Rossi and Fillion, watch for Patton Oswald, Thomas Lennon, and the always welcome Natalie Morales), but also offers some great work by its younger actors. Hewson is wonderful as the Hammond's teen daughter, who finds herself suddenly pushing boundaries (finding out her parents are murdering people quickly causes them to lose the "moral high ground" as disciplinarians) and developing deeper, newly adult relationships with each of her parents. Dealing with new domestic problems also leads her to develop a sweet bond with her nerdy next-door-neighbour and classmate Eric (20-year-old Skyler Gisondo). Gisondo brings some real depth to the geeky Eric, who is always ready with some timely facts about zombies and whose confident enthusiasm for the paranormal is at odds with the charming awkwardness he displays at the sudden friendship with his long-time crush. What's especially sweet is that for all melodrama of life in her home, Abby is consistently able to empathize with the normal crap that Eric is going through – in fact, her insane life seems to have made her more able to do so. Sheila and Joel aren't Bonnie and Clyde. They aren't sociopaths: they are two middle-aged people in love, committed to one another, fighting for one another. Joel contributes right away by stepping up to try to find suitably deserving victims for Sheila to eat (bemoaning, at one point, "Man, where are all the young, single Hitlers?"). As over-the-top as the scenario may be, there's some raw beautiful truth in Santa Clarita Diet's absurdist tale. Amid the sharply drawn satire of suburban doldrums and the enthusiastic embracing of zombie tropes is a touching and realistic portrait of the joys, struggles, and possibilities of married life. There are as many love stories as there are people who love – and, in its own dark, homicidal way, the story of the Hammonds is one of them. The first season of Santa Clarita Diet is currently streaming on Netflix. A second season has yet to be announced.